Lion (2016). Prepare for tears in this 4/5 stars, heart-wrenching adoption drama. 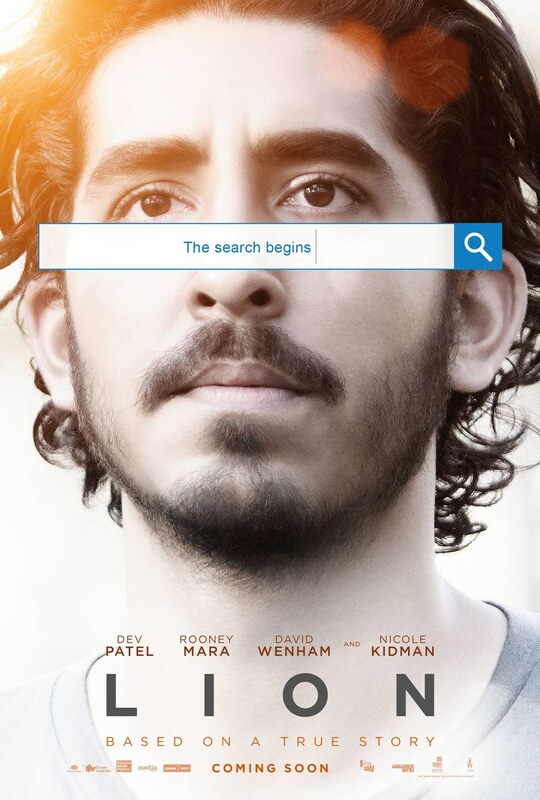 Film review by Jason Day of Lion starring Dev Patel, Rooney Mara and Nicole Kidman about an Indian boy, adopted by Australian parents, who travels back to his roots to try and find his family. Saroo is a small boy in a rural Indian backwater who ekes out a living picking coal from passing freight trains to sell. One day at a train station, his elder brother goes missing and, while looking for him, he is trapped on a passenger train travelling the breadth of India. Lost, frightened and unable to understand the native Bengali dialect, he finds himself in an orphan’s home and then adopted by a nice middle-class couple in Tasmania (Nicole Kidman and David Denham). He adjusts well to the new life and slowly forgets the trauma of getting there. But when is grown up, old memories are stirred. But how will Saroo find his family when he doesn’t know where he lived and the route of his train nearly 30 years ago? “You weren’t just adopting us, you were adopting our pasts as well” Dev Patel informs his beloved Tasmanian adoptive mother Nicole Kidman in this highly emotional and frequently teary drama. It’s a difficult statement for a mother to deal with, but in Lion there are no easy answers to any of the questions posed in this incredibly moving real-life story. Indian poverty, child homelessness, dodgy adoption and fostering procedures, failed cultural assimilation and drug abuse are all parts of the same tragic web that rolls out before little Saroo when he finds himself alone. You’ll be forgiven for thinking it sounds a bit like that other Indian poverty film Slumdog Millionaire (2008), incidentally also starring Dev Patel, although this story is less flashy and has its heart commendably on its sleeve, rather than glorying in it own self worth. Despite its lofty themes of success after extreme deprivation, director Danny Boyle and the Slumdog makers came in for a lot of flack for underpaying the movies child stars (though they subsequently established a trust fund in their names). At the close of Lion, we are told it supports a scheme to help lost children in India get back in touch with their families and it feels like believable, tangiable charity. Rooney Mara and Dev Patel in Lion (2016). Image courtesy of Entertainment Film. This is a proper 20-hankie weepie, with its Oliver Twist style home for waifs and strays and children being snatched from the streets, so bring a big box of Kleenex. If it were not for the skilful playing of this great cast, especially Patel and the superbly teary Kidman, it could have grated as an overwrought production. David Wenham, as the adoptive father, keeps the home waters becalmed with a gently underplayed sense of tact. Both he and Kidman, with their gentle diplomacy and cautious speech and placatory, non-threatening movements, add to finely realised atmosphere of passive tension in their immaculate house; like themselves, both welcoming and safe but clinically perfect as if they try too hard. But why is the talented Rooney Mara criminally under-focused as a rather disposable love interest whose sole function is to rouse Saroo’s interest in finding Mum? Its interesting to note how firmly established in rhetoric modern technology in the internet era has become. Saroo’s search for his family hinges on the use of a famous search engine’s map function, then an known quantity, now in everyday usage all over the world by millions. But, the closer he zooms in on his search, the fuzzier the image becomes. Trying again, he accidentally finds his home village, just before he loses all meaning and hope. Producers: Iain Canning, Angie Fielder. Music: Volter Bertelmann, Dustin O’Halloran. Dev Patel, Rooney Mara, Nicole Kidman, David Wenham. Moana (2016). 4/5 stars for this colourful and fun Disney/Pixar tale. Read this review for why. Sully (2016). After Deepwater Horizon, another winning disaster/inquiry recreation to watch.